To Cite: Karhan A N, Soyer T, Gunes A, Talim B, Karnak I, et al. Giant Omental Cyst (Lymphangioma) Mimicking Ascites and Tuberculosis, Iran J Radiol. 2016 ; 13(3):e31943. doi: 10.5812/iranjradiol.31943. Omental and mesenteric cysts are both rare pathologies in children. Children who have omental cysts usually display symptoms of abdominal distension, with or without a palpable mass. The mass can simulate ascites on clinical observation, or tuberculosis on radiological images. The optimal treatment for this condition is complete resection. The presenting symptoms of abdominal distension and the simulation of septated ascites and abdominal tuberculosis are unusual. Reported cases in the literature usually display symptoms of abdominal distension, abdominal pain, painless mass or possible ascites. 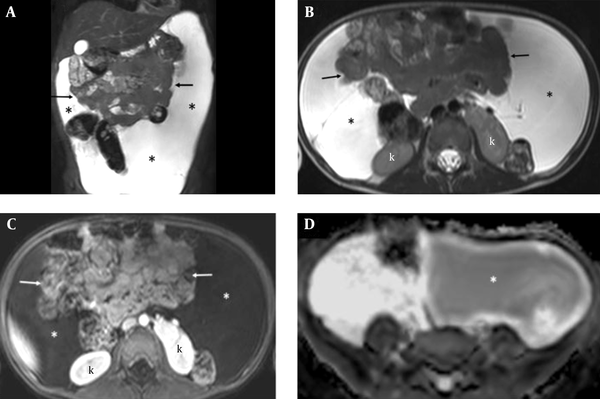 We describe the clinical presentation of a five-and-a-half-year-old boy who was treated for a diagnosis of abdominal tuberculosis and ascites at another hospital. After three years, he underwent abdominal surgery, and an omental cyst was found intraoperatively. The diagnosis was confirmed by pathological examination. The incidence of mesenteric and omental cysts is 1 in 20,000 among children, and even lower among infants. Of these two types of cystic mass, only 2.2% are omental cysts. Reported cases in the literature usually display symptoms of abdominal distension, abdominal pain, painless mass, or possible ascites. Many of these cases occur before the age of five years. Mesenteric and omental cysts are classified into four main groups: embryological, traumatic, neoplastic, and infective or degenerative. Lymphangioma is the most common cause of these cysts (1-3). A previously healthy five-and-a-half-year-old boy was evaluated at the hospital because of abdominal distension that was noticed by his family. Septated ascites was noted on ultrasonography, and further investigation was done with computerized tomography (CT), which revealed a mass. Tuberculosis peritonitis was the suggested diagnosis because of the radiological findings and a history of tuberculosis exposure from a close family member during infancy. A tuberculin purified protein derivative test, paracentesis for bacteriological tests, and cytology for malignancy were all negative. Antituberculosis treatment was given for nine months because of the family history of tuberculosis, despite fluid from the ascites being negative for tuberculosis, but he gained no benefit from this treatment. For the following two years, he did not receive any treatment, as the family did not seek medical help. The patient was admitted to our hospital for painless distension of the abdomen for three years, but without any complaints. His weight-for-age and height-for-age were in the normal percentiles. Physical examination was normal except for mild abdominal distension. Complete blood count, liver transaminases, and albumin were within normal limits. Ultrasonography revealed massive intraperitoneal fluid with septa extending from the subdiaphragmatic region to the pelvic floor. Diagnostic paracentesis was performed and 80 mL of serous fluid was removed, which proved to be transudate, with lactate dehydrogenase of 126 U/L, protein of 4.27 g/dL, triglycerides of 15 mg/dL, specific gravity of 1008, pH of 7.5, a fluid-protein/serum-protein ratio of 0.6, and equal serum and fluid glucose levels (99 mg/dL). Polymerase chain reaction analysis of fluid for Mycobacterium tuberculosis was negative. Magnetic resonance imaging (MRI) demonstrated significant fluid collection in the peritoneal cavity, displacing bowel loops centrally with the absence of bowel loop separation (Figure 1A - C). These findings were consistent with a giant space-occupying cystic lesion. No solid components were seen, and no enhancement was observed after administration of contrast. Diffusion-weighted images showed different diffusion properties of the fluid between the left and right parts of the cyst. The cystic contents of the left portion showed restricted diffusion, with dense fluid content (Figure 1D). The preoperative diagnosis was a mesenteric or omental cyst. The patient underwent laparotomy with a right upper transverse incision. A 25 × 20 cm cyst originating from the omentum was dissected from the surrounding structures. The mass was bilobulated, with a difference in color of the two parts (Figure 2A). The resection specimen was a multilocular cystic mass weighing 1,000 g, filled with serohemorrhagic fluid, and covered with a thin transparent wall. The microscopic features were consistent with lymphangioma; the cyst arising from the omentum was lined with an endothelial layer, and some areas of lymphocyte aggregates were detected within the stroma (Figure 2B). Findings suggestive for tuberculosis, such as granuloma formation, were not present, and no acid-fast bacilli were detected by Ziehl–Neelsen staining. Figure 1. A five-and-a-half-year-old boy with abdominal distension and septated ascites on ultrasonography. Coronal (A) and axial (B) T2-weighted and axial post-contrast T1-weighted (C) MRI shows a large cystic lesion(*) in the peritoneal cavity, displacing bowel loops centrally (arrows) and pushing the kidneys (k) posteriorly. No enhancement of the cyst (* in C) is observed after administration of contrast on T1-weighted image (C). Diffusion-weighted MRI shows restricted diffusion in the left part of the cyst (* in D), appearing hypointense on apparent diffusion coefficient image and revealing dense fluid content (D). Figure 2. A, Giant bilobulated omental cystic mass; B, Microscopic section showing lymphangioma arising from the omental fat tissue, with an area of lymphoid aggregate (H & E stain, original magnification × 4). Omental and mesenteric cysts are both rare pathologies in children. The incidence of mesenteric and omental cysts is 1 in 20,000 among children and lower in infants. Of these two types of cystic mass, 2.2% are omental cysts. Different etiologies have been discussed regarding the precise causes of these cysts, including benign proliferation of mesenteric lymphatics, failed fusion of the mesenteric leaves, and deficiency of the normal lymphaticovenous shunts (1-3). Lymphangioma is the most common cause of these cysts, which are generally restricted to the lesser or greater omentum (2, 3). Mesenteric and omental cysts are classified into four main groups: embryological, traumatic, neoplastic, and infective or degenerative. Pathologically, they can be unilocular or multilocular (4). The overwhelming majority of these cysts are mesothelial, lined by mesothelium as well as endothelial cells, and most contain serous fluid, which leads to the misdiagnosis of ascites (2, 4, 5). Patients admitted to the hospital may be classified into two main groups: those with acute clinical symptoms and those with non-acute clinical symptoms (4). Although symptoms correlate to the location and size of the cyst, non-acute clinical symptoms include painless abdominal mass, abdominal pain, abdominal distention, and possible ascites (1, 3, 5). Diagnosis of a cyst should be considered even if the findings are non-specific and the patient exhibits symptoms over a long period of time (6). The presence of complicating factors, including hemorrhage, torsion, infection, rupture, or pressure to other structures, is relevant with acute presentations that require urgent surgery (4). An accurate preoperative diagnosis cannot be made in many cases. Ultrasonography has been reported as the initial diagnostic tool in all cases. Sonographic findings frequently feature multiloculated, fluid-filled, and predominantly cystic lesions (2, 3, 7). MRI and CT may provide additional information for determining the detailed definition, exact extension, and characterization of the lesions (1, 3, 8). Most lymphangiomas appear homogeneous and cystic on CT. The signal pattern of lymphangiomas on MRI resembles that of fluid: low signal intensity on T1-weighted images and high signal intensity on T2-weighted images. The presence of proteinaceous, blood, or fat components within the lesion may alter the CT attenuation and MRI signal patterns. There are no specific findings for lymphangioma on diffusion-weighted MRI. In our case, restricted diffusion was seen in the left part of the cyst, revealing the dense fluid content, but there was no signal difference in the different parts of the lesion on the T1 sequence. The lack of fluid in the dependent recesses of the peritoneum, clustered bowel loops, and the absence of fluid separation between bowel loops are essential signs for differentiating between ascites and cystic lesions. Choledochal cysts, splenic cysts, multicystic dysplastic kidneys, intestinal duplication cysts, and ovarian cysts are all cystic lesions that can be included in the differential diagnosis of omental cysts (3, 9). The preferred treatment of omental cysts is complete excision, whether laparoscopic or not. Resection of the bowel and recurrence are rare. Malignant transformation of cystic lesions is also rare (1, 3, 9). Laparoscopic management has the advantages of lower cost and decreased morbidity compared to open surgery (1, 3). Omental cysts are rare pathologies during childhood and can mimic ascites. Clinicians should consider this diagnosis for patients with abdominal distension and a cystic mass in the abdomen. Authors’ Contribution: Drafting of the manuscript: Asuman Nur Karhan, Inci Nur Saltik Temizel, Berna Oguz, Beril Talim, Tutku Soyer, and Ibrahim Karnak; surgical procedure: Tutku Soyer and Ibrahim Karnak; acquisation of data: Berna Oguz and Altan Gunes.